In 1851, Hermann von Hemholtz invented the opthalmoscope, making it possible for ophthalmologists to visualize the posterior segment of the eye. Since then, imaging modalities in the eyecare industry have undergone several upgrades. In 1926, Carl Zeiss and J.W. Nordensen unveiled the first reliable fundus camera, allowing the capture of structures in the ocular fundus with a 20-degree field of view. The Carl Zeiss company later released a camera with a 30-degree field of view, permanently raising the bar in ocular fundus photography. With this expanded field of view, imaging of the optic nerve and posterior pole was now possible but one problem still remained: how do we view the peripheral retina? This dilemma is now resolved with the development of Optos Ultra-widefield camera, which has revolutionized ophthalmology. 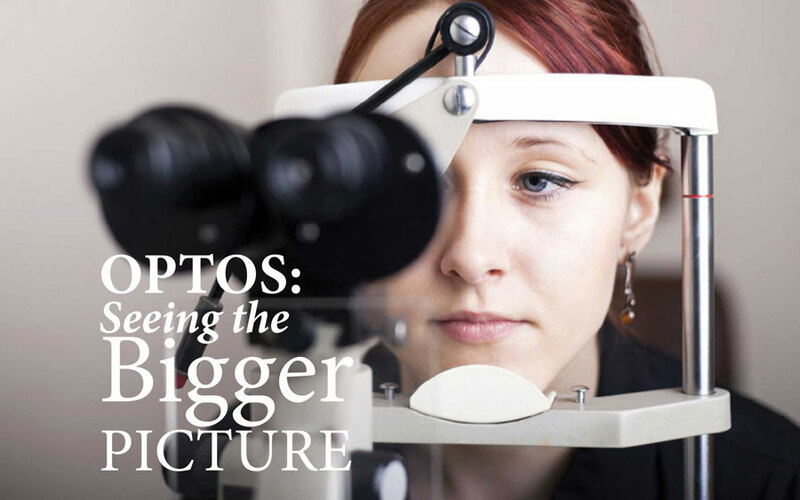 The Optos camera produces ultra wide-field images with an astounding 200-degree field of view, roughly 82.5 percent of the retinal surface area. Using ellipsoid mirrors, the camera obtains images of the retinal periphery without the need for bright lighting, contact lenses and in some cases, pupil dilation. Although traditional fundus cameras are capable of providing images of the retinal periphery, multiple photographs must be taken and then sewn together into a montage. In order to achieve such a montage, each image must be taken at a different phase in the angiogram. For instance, one image might be taken at 40 seconds, the next at 1 minute, and the next at 5 minutes, etc. This method of imaging makes it impossible to view most of the retinal periphery at a single phase in the angiogram. The new camera, however, provides a 200-degree, full field of view with each capture. This advantage is crucial in the diagnosis and treatment of many eye diseases, such as diabetic retinopathy and peripheral retinal diseases. Ophthalmologists have been using fluorescein angiography to evaluate the blood vessels and circulation within the eye since 1961. The Optos camera is capable of producing high-resolution fluorescein angiograph images of the retinal periphery. These images provide indispensable clinical use in the treatment diagnosis and monitoring of patients with retinal vascular disease. The equipment is also capable of producing wide-field autofluorescence images, which are helpful with disorders that affect the retinal pigment epithelium. Wide-field angiography has been used to image the anterior retina in patients with diabetic retinopathy and has proven to greatly improve clinical examination. Additionally, this new technology has enhanced the evaluation of diseases such as uveitis and vasculitis, which also present with peripheral vascular changes. Fluorescein angiography can detect vessel incompetence and inflammation that otherwise proves difficult to detect during peripheral retinal evaluation through the use of an indirect ophthalmoscope. Wide-field fluorescein angiography improves the accuracy of this evaluation. Recent reports have also indicated that wide-field imaging was able to image the peripheral retinal vascular pathology in patients with sickle cell retinopathy, something that has never been possible with traditional fundus photography. The Optos camera also utilizes scanning laser ophthalmoscopy (SLO) technology. Using laser light and the principles of confocal laser scanning microscopy, SLO produces high resolution, high contrast images that are simply unachievable with standard fundus photography. There are also a myriad of other benefits for eyecare providers. The imaging modality decreases time spent on angiograms, sometimes reducing the usual 10-15 minutes to a mere 5 minutes. This greatly increases the patient flow for ophthalmologists and simultaneously results in happier patients. With this system, photographers are also on the same side of the equipment as the patients, facilitating patient alignment. All of these advantages, in addition to its incomparable quality of images making Optos a game changer in eyecare.